Video of the 1985 performance of Voices, presented at California State University, Los Angeles. Medium: VHS video Comments: Hassinger writes that “’Voices’ was first performed at The Women’s bldg. in Los Angeles in 1984. It was the separate voices of 6 people made into an orchestra by a conductor. I wrote and directed the action. The conversation was about our relation to nature in the political realm in which we found ourselves.” In a statement read aloud at the end of the 1985 performance, Hassinger states that Voices articulates “concern for the role of nature in an increasingly technological society.” The performance includes video edited by Ulysses Jenkins and quotations from the novels of Walker Percy. 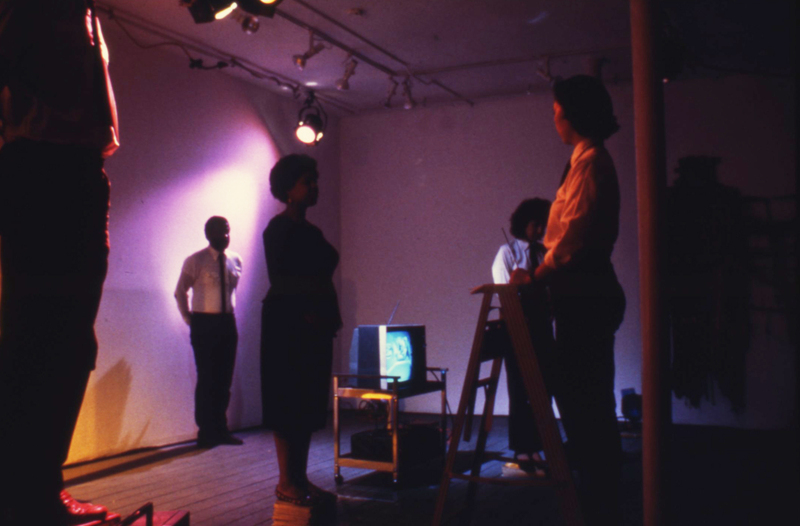 It is one of several performances Hassinger describes in her “Manifesto” as “Post-modern commentaries on politics, the end of nature, etc.,” created for friends, including Senga Nengudi and Ulysses Jenkins (“classmates from Lester Horton dance classes”) and Dee McMillin (“a student from Cal Arts”). In 1985, other cast members included Mary Abrams, Cindy Kahn, and Chris Troy. For the premiere performance at the Women’s Building, May Sun conducted the performers; in 1985, Hassinger served as conductor. Medium: 35mm slide Comments: Hassinger writes that “’Voices’ was first performed at The Women’s bldg. in Los Angeles in 1984. It was the separate voices of 6 people made into an orchestra by a conductor. I wrote and directed the action. The conversation was about our relation to nature in the political realm in which we found ourselves.” In a statement read aloud at the end of the 1985 performance, Hassinger states that Voices articulates “concern for the role of nature in an increasingly technological society.” The performance includes video edited by Ulysses Jenkins and quotations from the novels of Walker Percy. 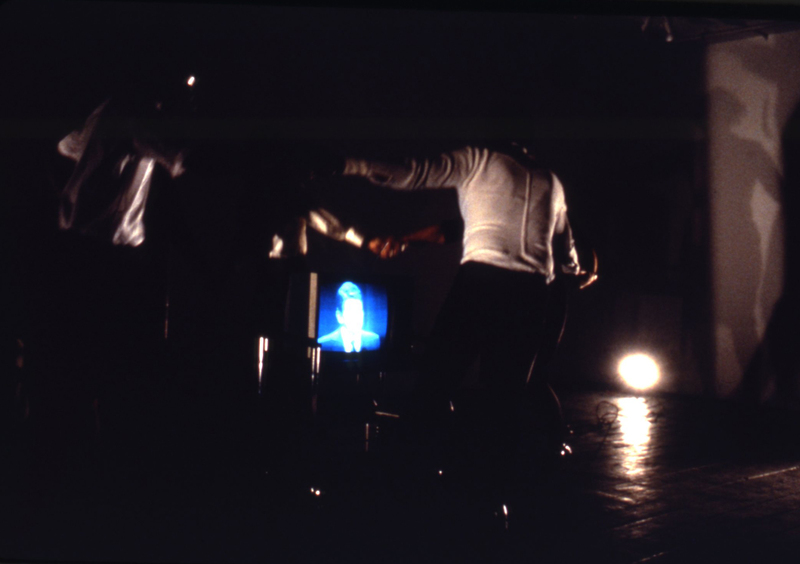 It is one of several performances Hassinger describes in her “Manifesto” as “Post-modern commentaries on politics, the end of nature, etc.,” created for friends, including Senga Nengudi and Ulysses Jenkins (“classmates from Lester Horton dance classes”) and Dee McMillin (“a student from Cal Arts”). In 1985, other cast members included Mary Abrams, Cindy Kahn, and Chris Troy. For the premiere performance at the Women’s Building, May Sun conducted the performers; in 1985, Hassinger served as conductor.